Mt. 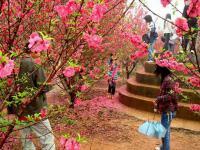 Huashan, or the Flower Mountain, is located in Ningming County of around 160 km from Nanning City. The cliff wall seemingly looks down on the river from about more than 120 meters from the foot of the mountain, with the lowest part being about 10 meters and about 172-210 meters in width for an area of more than 8000 square meters. 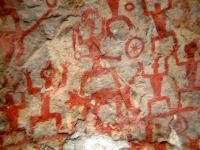 There are 111 groups of paintings, with 1,900 images, including figures, animals, bronze drums, knives, swords, bells, boats and roads. According to archaeological researches, this precious art treasure was drawn by the ancient Zhuang ethnic people of over 2,000 years ago. The largest painting is 44 meters wide and 170 meters long with bright umber colors and uninhibited lines. Altogether there are 1,300 human figures; the tallest (which is rare for its large scale), reaches three meters, and the smallest, 30 cm. Some of the figures resemble warriors, while others are like chiefs and generals, brandishing swords and riding steeds; some are dancing. There are also bronze drums, dogs and horses among them. The themes are of great value to the study of ancient local cultures. 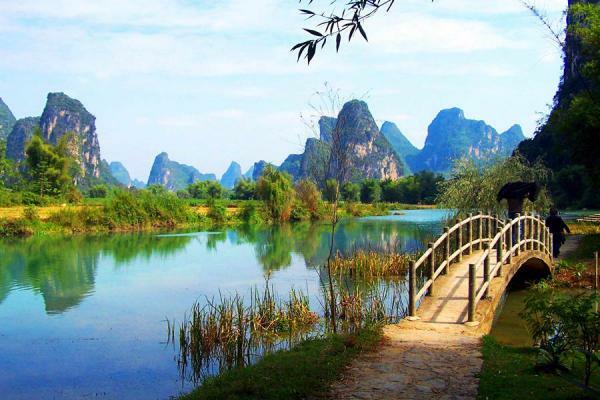 Crossing the river, there is an open space, the best place to view the rock paintings.